Leading Manufacturer of convection oven and countertop convection oven from New Delhi. 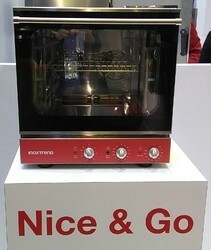 Electric ovens with Analog or Digital controls. 4 levels with several types of capacity: 2/3, 433x333, 1/1 and 600x400. An ideal range for small bars or food trucks that need a small oven to heat up or cook croissants, small pastries, bread or simple dishes. We are a noteworthy organization in this field engaged in offering Countertop Convection oven to most of our quality centric clients. This oven is manufactured under the visionary guidance of highly skilled professionals who have got immense years of experience in allied domain. This special kind of oven is efficient enough in providing excellent results baking and heating of various food products through convection process. Moreover, we offer this oven at reasonable price.